• Sleeping Beauty LP - the last one we have! • Big Bambu LP - with huge rolling paper. Also, the last one we have. • Earache my Eye single - which includes extra comedy dialogue. • Black Lassie single - hysterical, rarely seen artwork on sleeve. NOTE: You can still buy Santa Claus and His Old Lady. It's available on the Anthology CD. Tonight we've officially unveiled this week's auctions. However, this week we've included something extra special for the holidays, the hard-to-find Cheech and Chong's Santa Claus and His Old Lady single in MINT CONDITION. The sleeve photo is far out and the single is hysterical. Take a look for yourself. Don't fret! If you're not the high bidder, you can still get the song. Santa Claus and His Old Lady is also available on the Anthology. We've postponed this week's Cheech & Chong Dot Com auctions til Saturday (we'll have a special Christmas auction). Instead, we are offering all our CDs at 30% off and with free shipping if you order 3 or more. We even have the hard-to-find Santa Claus and His Old Lady single. Santa Claus and His Old Lady is only available on the Anthology. Title says it all. We've added new photos to the "Free Downloads" section of the site and optimized those photos which were already there. Enjoy! BTW. We added more items to our auction a couple days ago. That's right! Cheech and Chong Dot Com now has auctions. W'e're going to be auctioning off our humongous collection of rare, hard-to-find albums, videos, press kits, 8-tracks, 45s, and much, much more. We even have the highly requested original vinyl copies of Cheech and Chong's Sleeping Beauty from Ode records. The auctions will be begin after Tuesday's episode of Dharma & Greg and updated often. Click here to see what's up for auction this week. Be sure not to miss this week's episode of Dharma & Greg. In this episode, Dharma & Greg get married and resident of the local park (Tommy Chong) pushes Greg into a decision about his career. Dharma & Greg airs Tuesday 9/8c on ABC. E! Entertainment Television just wrapped up shooting their Mysteries & Scandals on the infamous Cheech and Chong. This is E! 's weekly documentary which reveals untold stories about hollywood's legends. In fact, E! has been posting requests for insider information on our message boards during the past few months. We have received definite confirmation that both Cheech Marin and Tommy Chong were interviewed and will be presenting their sides-of-the-story regarding their break-up. Cheech and Chong Dot Com is not yet aware of the Air Date, but will let you know when we have it. If you know, please contact us at news. Cheech & Chong Dot Com is pleased to announce our partnership with Black Star. Black Star is Europe's number one online video store and provider of PAL formatted videos (note: VCRs in Europe typically only play PAL, not NTSC). To all of our European visitors: this is what you've been waiting for. Now you can purchase some of your favorite Cheech and Chong movies in PAL. The infamous Big Green Van from Up in Smoke has finally been found. Melinda A. Cuslidge, an official restorer of the infamous Green Van, contacted us last week to give us the scoop. Currently, this masterpiece is in the possession of her father and his friend. Dave Cuslidge, Melinda's father, and Jesus Torres decided to purchase the van from Dave's friend for $700 and is now in the process of restoring it. On a related note, Melinda was responsible for, among other things, painting "Sweet & Low Upholstery, 1817 Calle de los Sofas" on the side. You, too, can see the Big Green Van in person. Shortly, it's owners will be displaying it at auto shows around California. This is the batmobile for cool people! On Monday, the cast of Nash Bridges will return from summer hiatas to begin shooting the fifth season of this CBS series. Cheech and Chong Dot Com would like to wish Richard "Cheech" Marin good luck with this season, as well as a Happy belated Birthday (July 13th). 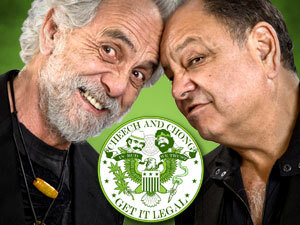 C & C Dot Com now carries the complete Cheech Marin, Tommy Chong film catalog. Cheech and/ or Chong appear in each one of the 20+ newly added films. Titles include HARD-TO-FIND Far Out Man and It Came from Hollywood to name a few. Click to see the new flix. Release date: Monday May 10th. Here's your chance to leave a message for Cheech, Chong and the tens of thousands of fans that visit this site each month. Remember to include your email address so people can write to you. It will feature bits from his comedy act, as well as plenty of toking. C&C Dot Com will post the release date as soon as we receive confirmation from the Chong camp. ISBW's "Slack Website of the Week"
Cheech & Chong Dot Com was the "Slack Website of the Week." This is a great web site. Be sure to check it out.